· Peel the sin off and cut the potato into small pieces and wash.
· Pressure cook for 5 minutes with add little salt and water. Don’ t overcook.Or Microwave the potato till done. Let it cool. · Add curd when it is become cool. 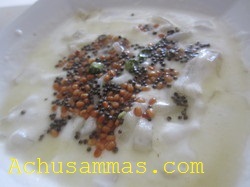 · Take a pan with oil, add mustard seed start to spluttering add urad dal ,fry till urad dal is become drown. 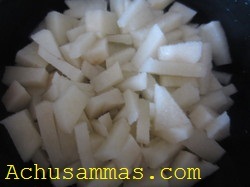 · Pour this mix into potato curd mix and enjoy with rice. 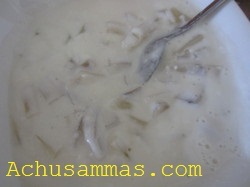 Sending this into Sobha,sGood Food "Just 4 Fun"
I too make it the same way, looks really yummy.. Innovative recipe,looks so yummy n delicious.